Reclaimed HFCs are ‘quota free’ and therefore will be critical in playing their part in ensuring there is enough product available on the market to meet demand as the successive cuts in quotas impact upon availability. The big quota reduction in 2018 will be the first real test and EPEE (European Partnership for Energy and the Environment) has estimated that as much as 25% of the quota shortfall will need to be met by product from reclaimed sources. By converting or replacing equipment running on higher GWP products such as R-404A, R-507 and R-422D to much lower GWP refrigerants the recovered product can be reprocessed and brought back to its original ARI specification. When recovered the refrigerant is typically out of specification for moisture content, acidity and high boiling residue such as particulates, but it can be reprocessed and brought back into specification for reuse. As part of the F-Gas Regulations it is mandatory to recover all refrigerant from systems and in particular at end of life. Specially identified recovery cylinders in a range of sizes are available for this purpose. The recovery must be done by those holding the correct qualifications for handling refrigerants and in conformance with the hazardous waste regulations for documentation and transportation. Only if the recovered product does not leave site and is put back into the system it came out of, does it avoid being classified as waste. What does reclamation of refrigerants mean? Reclamation of HFC refrigerant means “the reprocessing of a recovered fluorinated greenhouse gas in order to match the equivalent performance of a virgin substance, taking into account its intended use”. The refrigerant is cleaned of all impurities to an AHRI 700 standard (the standard required for virgin product) enabling it to be resold as regenerated product to the market. It will perform in exactly the same way as virgin product. Recycling is putting the recovered refrigerant through a basic cleaning process and usually means there is no analysis or quality assurance attached to the product in terms of specification or purity. It may not perform in the same way as virgin product and the risk is with those using it. For peace of mind, best quality and system operation it is recommended recovered product is bought back to ARI specification by reclamation. For those companies who have more than one or several systems running on high GWP refrigerants either at the same site or across a number of sites, it is possible to convert equipment to lower GWP replacements one at a time and have the recovered product reclaimed back to specification for use on systems not yet converted. If done in an organised and planned way this can eliminate the need to purchase high GWP quota products at high prices and have the reclaimed product at a much reduced cost for when it is needed. There is no need to panic about getting out of high GWP refrigerants if a planned replacement programme is in place. 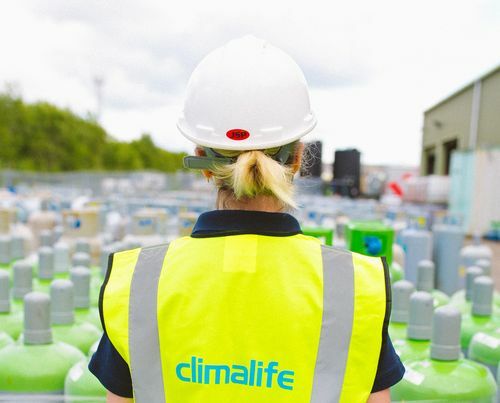 Climalife can discuss Bespoke Reclamation arrangements to suit either the end user or a contractor looking after multiple sites.